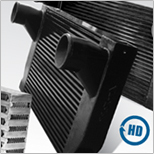 Today, charge-air coolers are used on virtually every heavy-duty truck. they are essential to meet engine manufacturers' design objectives for horsepower, fuel economy, and exhaust emissions. We offer a full line of products featuring our New and New Heavy Duty Charge-Air Coolers and accessories. Av-Tekk Products begin with our industry leading HD Coolers (Our Heavy Duty Bar & Plate Designs.) The Av-Tekk line doesn't stop there, no our New O.E. style, (Tube & Fin Designs) offer the perfect replacements for that factory equipment. Click on the corresponding links below for more information. Know Your Service Options, Click Here. Find the right Av-Tekk Charge-Air Cooler for you, use our Cross-Reference Tool today! Quick Check Leak Test Kit, the name says it all, and who can beat not even having to remove the cooler from your vehicle to test it for leaks. Av-Tekk Brand Hose & Clamp Kits are an Industry First! These little kits make purchasing your new cooler easier than ever. Click the corresponding links below for more information! Av-Tekk Brand, Hose & Clamp Kits Industry First! What is a Charge-Air Cooler You Ask? Click Here To Find Out.